Atelier S/Z is the brainchild of two dynamic designers: Sibylle Tamer and Ziad Abillama, a daring couple in the artistic field who in the duality challenge each other’s creativity since December 2002 each one of them had his own items, later on Sybille continue her own products design alone. In 1998 Sibylle Tamer Abillama obtained a degree in fine arts at Alba Lebanon, and later on joined Parson's school of design in New York city. She exhibited her masterpieces in New York, Europe, Middle East and Lebanon. The many talented Lebanese artist has also extended her creativity to a special photo exhibition concept title "COLERE" which is a wakeup call for the deteriorating life in this country, and to supposedly try to find a solution to the internal political problems in this Lebanon in an artistic way. she selected her feelings from her thoughts before combining function; otherwise, it would have been blocked. She selected also her way of life to see the frustrations and problems of this ugly world that inspires her, and that she tries to transform through her work. The joint workshop displays new designs, basically 'Thinking out box' & recently "Create & Wear" her workshop for "Beirut design Week" 2014. Designs such as the 'Why U - Y me?' 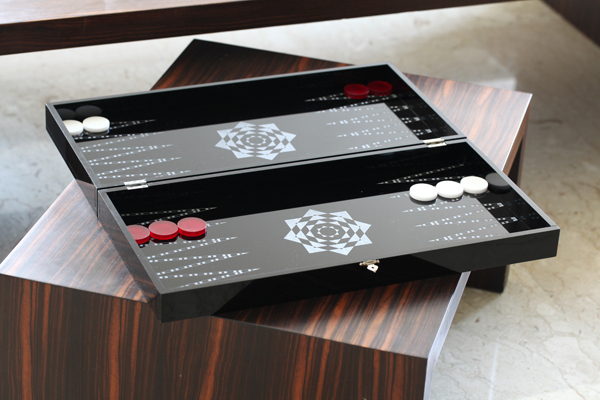 shisha concept, and the backgammon dice titled "Mastara"with a twist, to awaken old Lebanese traditions in a new notion.